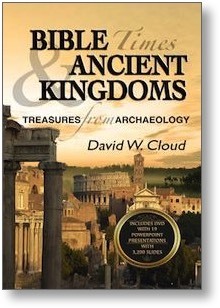 Bible Times and Ancient Kingdoms is a training course on Bible geography, Bible culture, Bible history, and Bible archaeology, which has a two-fold objective: to present apologetic evidence for the Bible and to give background material to help the student better understand the setting of Bible history. It is a package consisting of a book and a series of PowerPoint and Keynote (Apple) presentations which are a graphical edition of the book. The PowerPoints are packed with high quality color photos, drawings, historic recreations, and video clips. Bible Times & Ancient Kingdoms covers the fascinating historical world of the Bible from Genesis to the New Testament, dealing with the Table of the Nations in Genesis 10, the Tower of Babel, Ur of the Chaldees, Egypt, Baal worship, the Philistines, the Canaanites, David’s palace, Solomon and the Queen of Sheba, Edom, the Nabateans, and the Spice Route, Ahab and Jezebel, the fall of the northern kingdom of Israel, the Assyrian Empire, Hezekiah and his times, Nebuchadnezzar and his Babylon, the Medo-Persian Empire, Herod the Great and his temple, Rome and Her Rule over Israel, Christ’s ministry on the Sea of Galilee, From Jericho to Jerusalem, Christ’s Passion Week, and Rome’s Destruction of Jerusalem. Many of the archaeological discoveries from the past 200 years, which we relate in the course, are so fascinating and improbable that they read like a novel. It is easy to see God’s hand in this field, in spite of its prevailing skepticism. The course also deals with Bible culture, such as weights and measures, plant and animal life, Caesar’s coin, the widow’s mite, ancient scrolls and seals, phylacteries, synagogues, false messiahs, judgment in the gate, ancient shipping and commerce, cosmetics, fine linen, the widow’s mite, the pomegranate, mustard seed, idolatry, divination, tombs, the operation of ancient lamps, ancient war methods, millstones, pottery wheels, and olive presses. The course begins with an overview of Israel’s geography and a timeline of Bible history to give the student a framework for better understanding the material. Each section includes maps to help the student place the events in their proper location. The course is packed with important but little-known facts that illuminate Bible history and culture. The preparation for the book is extensive, the culmination of 45 years of Bible study, teaching, and research trips. In this context the author built a large personal library and collected information from major archaeological museums and locations in North America, England, Europe, Greece, Turkey, Jordan, and Israel. We guarantee that the student who completes the course will read the Bible with new eyes and fresh enthusiasm. 572-page book + DVD containing 50 PowerPoint presentations packed with about 4,200 high quality color photos, drawings, historic recreations, and video clips. Select eBook format in cart. 1.) The files in the digital download package are large. If you are not experienced in downloading large files (250 to 300 mb) we suggest that you purchase the Book and DVD package. 2.) The download files are compressed (zipped). If you are not experienced in "expanding" zip files we suggest the DVD package. 3.) Some internet providers have limitations on downloads and may "throttle" (or even prohibit) large downloads. If in doubt, check with your internet provider.